There have been many different designs for tenon jigs through the years. This is my interpretation. There is really nothing in this design that has not been done before. I just eliminated what I haven’t liked in some designs and put the things I did like into this one. For example, I like a tall fence to hold tall pieces vertically. I like a wide fence to hold wide pieces vertically. I’ve never made an angled tenon in my life but I never say I won’t. So I’ve designed it with plenty of room to add “swivel pie” fences anytime I want to. 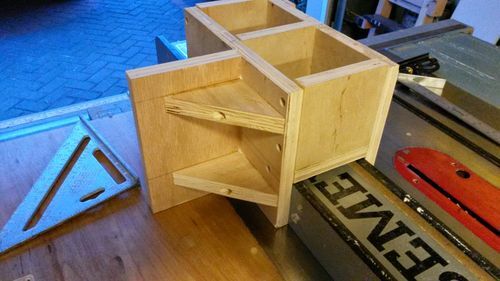 Since I’m doing a series of shop tools/jigs with new woodworkers in mind, I changed the design to make it easier to build without any special tools. The one I’ve used for years used dado joints. This one uses dowels. If you can drill and put in a screw you can drill and put in a dowel. Speaking of screws, the only screws in this project are those used temporarily during assembly and those on the sacrificial fences so that they can be replaced as needed. If you look at the layout sketch you see that it does not match the one I built. The sketch is the basic working jig. There is no difference in how it is used or how it performs. You can build to the sketch and have a fine tenon/lap joint jig. I want to encourage making changes, if the builder wants to make it his/her own design. I just got a bit carried away trying to show how the jig could be modified as long as you paid attention to all the basic structure of the design. Maybe I got a bit frivolous, but I kind of like it. In addition to making tenons, I use this jig for making lap joints and notches in the ends of material. 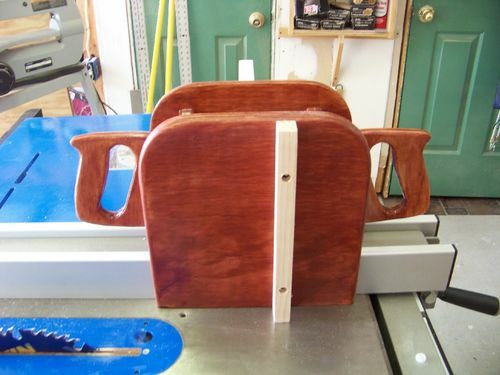 It’s faster and easier than setting up a dado set or using the router. And it’s safer than just standing a board up and running it along the fence or trying to balance it against the miter fence. This project starts using the things we’ve built so far: the T-square, push sticks and dowel cutting jig. The jig is built with 3/4 ply and 3/8 dowels. The fences can be anything you wish (scrap). Just be sure they are flat and straight. The fences are sacrificial and are attached with screws. The 2 side pieces are 10 X 10. Always trim an edge first then cut to size. Do not trust that factory edges are straight or square. Besides, your tablesaw will leave a nicer edge than the factory. Cut the side pieces and the angled fence support pieces for the wide fence and set them aside. The angled fence support pieces are sized at 4 X 4 which yields a 45-degree angle. Use your miter gauge. Now for the bottom center board and the 2 vertical supports. As shown in the sketch, you need to know the width and height of your fence. In general, fences are not the same height, measured from the table, all the way from front to back. There is variance and you don’t want the jig riding up and down. Add 1/16 or so to the height measurement so the jig does not actually sit on the fence. Also, fences are not generally square to the table on both the left and right sides. Place a square on each side of the fence, square to the table. Measure between them and use this measurement so you know the jig will be square to the table. To illustrate, I raised one side of my fence so it would be a bit off. The board on top of the fence is cut precisely to be the width of the fence. The square on the left touches the fence at the bottom but not the top. The square on the right is flush all the way. The angle on the fence face changes the dimension of the width of the board you need to cut. Al three pieces – the center bottom board and the two vertical support boards must be the same width. Rip a piece of ply long enough for all 3 pieces then cut them to length. This will ensure they are all the same width. 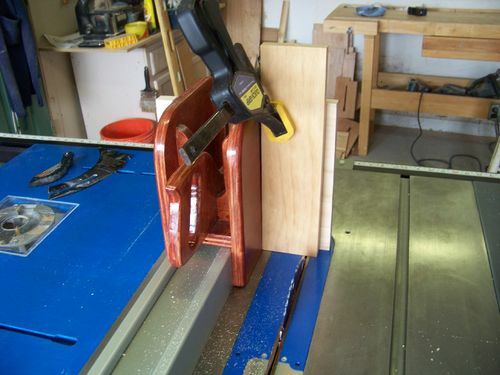 Now, leave the 2 angled wide fence pieces on your bench and dry assemble the jig on the tablesaw. Set the center bottom board on the fence. Stand up the two vertical supports and put the 10 X 10 side pieces up against it. Use two clamps (front and back) to sung things up – not tight. Now lift to the line and square up the bottom center board to the side boards. The 2 vertical supports will just follow. Tighten up the clamps. Check that each of the side boards are square to the table. If not, check that the bottom center board remained square and the 2 vertical supports are reasonably straight. Assuming you got the width right, just jockey things around and they should come in square. Also, try moving your clamps a bit. Sometimes they can throw things off. If you can’t get the jig to square up check these things. See that both side pieces are touching at the bottom of the fence. If not, your center boards are way too wide. Cut them down. If they are touching at the bottom of the fence check the gap with your square against the side pieces. If the gap is at the bottom your center boards are slightly too wide. Here’s a little trick when you just need a hair taken off. Put one of the boards against the saw blade and move the fence up to it and clamp it down. Pull the board out and start the saw. Now run the boards through. The blades will just barely nip at the edge. If the gap is at the top of the side board then your center boards are too narrow. You may have to cut new ones. If we’re talking just a whisker too narrow you can commit a woodworking sin and fix it. Just remember you’re going to Hell, or at least Purgatory, but it works. Put a strip or two (or 3 or 4) of masking tape on one side of your 3 center boards and build them out until they fit. Yes it’s sinful to some but it works and the jig won’t really care. The dowels will hold all the joints tight longer than you’re joints will stay tight. Now you’ve adjusted whatever you had to and both you and the jig are happy. 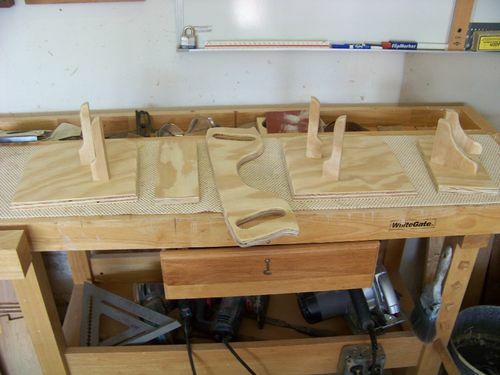 Lay out all your pieces on the bench. Sand everything down. These are all of my pieces for the jig. If you built to the sketch you only have 7 pieces and not 11. I show what I did so you can see how I kept the structural integrity of the jig while being a bit playful. (God I sound like a girl!) The handles are from the same saw I used for the push stick handles. You can trace and cut out comfortable handles from a saw you like and just attach them to the vertical support boards if you wish. Use you imagination and have fun. As a side note, the rubber mat on my bench is drawer liner. You can get it at the big box stores either in the tool or home section. It is great for sanding, especially small pieces. It grips and holds them without needing a clamp or making you jump when the edge of the sanding disk hits your fingers. Aw come on – you know what I mean – you know you did it, Also, cut a hunk off and use it in the kitchen. It makes a dandy grip for opening jars. 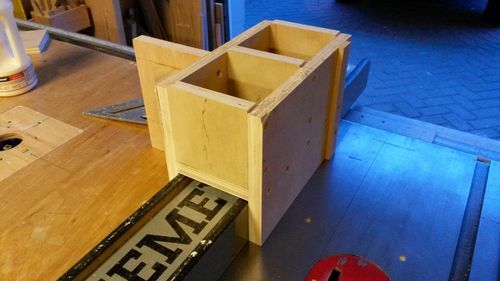 If you wish you can round the top corners (knock off the square points) and ease the outside edges of the top and sides of the two 10 X 10 side pieces. I’ve never had this jig jump when I’ve used it. But I don’t like sharp corners or edges just in case. There’s plenty of beer time built into assembling this so don’t panic. You can glue and screw everything if you want. But, in my experience, screws don’t hold well for long in end grain ply. I used 3/8 dowels. They’ll keep her together and keep her straight and square through use and the bangs she’ll get over time. Now, I’m not saying not to use screws to make assembly easier. As you’ll see I use them. Put the angled fence support pieces together first. Measure and drill two 3/16 (or screw size) holes through the right side board for each angled support piece. Use you square and make sure the holes are lined up or the 2 fence pieces won’t be in line. Line up one of the pieces and keep it lined up on you square. Drill pilot holes into it through the two holes you drilled in the side board. Brush some glue on the edge and screw it in place. (Yup I said screw them in place.) Do the same to the other. Now check that they are lined up perfectly with each other and square to the side board. Now is your chance to fix a mistake. If you find they are not aligned, check that one of them is square to the side board. Leave this one alone and move the other one. The vertical height of each one is not critical but having them aligned to each other and square to the side board is. Moving one up or down is not an issue. Once you’re satisfied that everything is correct, set this sub-assembly aside. Now assemble the two vertical support pieces to the bottom center board using the same process. Drill 2 holes through – drill pilot holes – brush on glue and screw it together. The critical thing here is that each vertical support board is square to the bottom center board. If it is angled it will be wider and nothing will fit. It’s one of those hypotenusey thingies. Set this sub assembly aside when you are satisfied all is right. If you modified the design add your changes the same way – building from the inside out. Let the glue on the sub-assemblies bake a while and go have a couple of beers. Now the glue has set. Let’s put in some dowels. The screws were just temporary clamps. They allowed you to assemble everything, adjust what you had to and then hold things together while the glue dried. Now go through and pull one screw at a time and replace it with a dowel. I used 1 1/2 inch 3/8 dowels. As I noted in the dowel cutting jig post, I cut 1/16 less than the length dowel I want. Cutting a little more off don’t hurt. That gives a space for glue and air at the end of the dowel and won’t push your dowels back out. Put some masking tape around your 3/8 drill bit as a depth gauge. Remember that the end of the drill bit is tapered and the bottom of the hole won’t be flat. Place your tape on the bit with this in mind. Remove a screw and enlarge the screw hole to 3/8 inch at the depth you taped off. Brush glue on the dowel and tap it home. Make sure you have the other end of what you are putting the dowel into on the workbench to absorb to taps without knocking things apart. Don’t try to tap the dowel in flush. Maybe you can but it never works for me. I always end up with it recessed and have to fill the dent. Leave it just a wee bit proud and sand everything flush later. Wipe off any excess glue from the workpiece and the hammer/mallet you used before you go on to the next one. Replace all the screws, one by one, with dowels. Now all of the interior pieces are put together. Drink some brew and let the glue set up a while then sand all of them down so the dowels are flush. You can’t get to them after you put the side pieces on. Pay particular attention to sanding the bottom center board. You don’t want a dowel nub hitting your fence. It takes a sharp chisel to get at and fix anything you don’t get flush now. Now that the sub-assemblies are done we can add the side 10 X 10 boards. I find this easier to do on the table saw. Brush glue on all the edges of the inside pieces and clamp everything up over the fence. Make sure the center bottom board is raised to the line above the fence. Check that both side boards are square to the table. You may have to move your clamps around because they can screw things up sometimes instead of helping. Put 5 screws into the bottom center board and 2 into each vertical support board. Carefully lift it off the fence. Wipe of any glue squeeze out. Wipe off any glue that got on the fence or table of your saw. Go have a couple more beers. When the glue sets up replace the screws with dowels using the same methods. Sand the dowels flush. 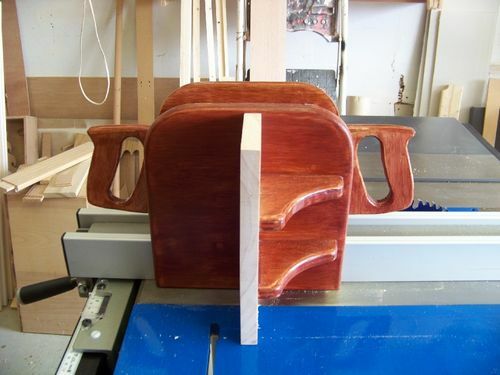 It’s a shop jig – leave it as is or put a finish on it. If you put a finish on it, don’t make extra work for yourself like I did. Don’t put finish lower than the center bottom board inside the jig where it rides the fence. Just wax this area when you’re done. I didn’t even think about it and I finished the whole blasted thing. Holy crap! Why is this thing so tight? Did I screw up the measurements? The assembly? Besides other tenon jigs and other “fence riders” this is the third one of these I’ve built. You’d think I knew better. There I was with 80-grit hand sanding all that crap off. Boy, stain and poly plug up sandpaper fast. Wait a minute. On second thought, I recommend everyone finish this area. Why should I be the only idiot? There’s room for lot’s more people in Stupidsburg. Now screw on the 2 sacrificial fences and you’re done. Just make sure they are square to the table and the bottom screw on the narrow fence is well above where you’ll cut. First cut the front and back of the tenon. 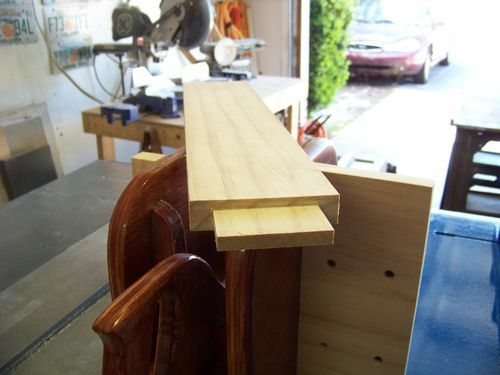 Hold a board flat on the side of the jig and square it up against the narrow fence. Use a clamp to hold it in place. Move the fence over to where you want the cut, lock the fence and make the cut. Some tenons are deep so adjust your speed accordingly. Lift the jig off the fence after the cut and bring it back. You may get away with pulling it back past the blade but be aware it will affect the width of the tenon slightly. Unclamp the board, turn it around, clamp it and cut the other side. Now turn the jig around to change from the narrow fence to the wide fence. Clamp the board to the wide fence. Like I said, I’ve never had this jig jump on me. But I turn the clamp so the bar is not pointing at me just cuz I’m a sissy. Slide the fence over to where you want to make the cut and clamp it down. Make the cut. Turn the board around, clamp it and cut the other side. Now use the miter gauge to cut off the waste. Use a block clamped to the fence as a stop to make every cut the same. If you try to cut them by eye (or at least when I try) you end up with the shoulders being slightly different distances from the end of the tenon. The result is varying gaps when you bring the mortise/tenon together. The only variable you want is the saw blade height. Personally, I’d rather have a wee tiny shoulder left beside the tenon than to cut into the tenon. I find that the tiny shoulder does not normally present a problem that keeps the tenon from seating. If the tenon does not want to seat without excess force, I take sandpaper or a rasp to the top edge of the mortise. The shoulders on the tenon cover it anyway. Very light pressure. Very little has to be opened up and only at the outside edge. It just lets that extra tiny shoulder clear. The primary joint is unaffected. I’ve not had one fail anyway. This is how I do it. I know people who fine tune with a sharp chisel. I know people who fine tune with sandpaper. I don’t mess with the tenon. I just open the edge of the mortise. I’ve seen some of the beautiful work that people do on this site and I can just feel them cringing. That’s just the way I do it. Now the jig is up. Go have another beer – if you haven’t had enough already. Jeez, feel like I need to highlight portions of your post so I can come back to it when negotiating the build. There are sections that are self explanatory and others I need to re-read…... and re-read again for it to sink in. Thankfully you explain things so well that you can almost picture the pieces going together. Think I mentioned before that visualizing is not my strong suit but your detailed instructions make everything easy. Thought I had a handle on this woodworking stuff but after reading a few of your posts, I feel like a student while you’re the professor. And the good news is the tuition is free! You’re a card Tom. I knew this one would take some thought because it’s making a tool part of your saw. An understanding of your saw (fence) is needed to make them work together. But, as always, it is harder to describe than it is to actually build. BTW, I was an Engineering professor for a couple of years. Low pay and I found I was turning into a bigger nerd than I am naturally. Left that and went back to designing, reinventing and fixing things. Have fun and keep that sense of humor going. 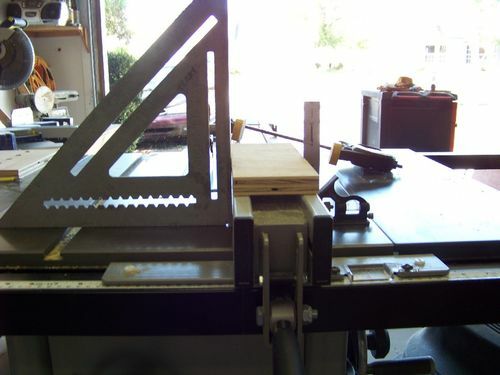 I’m making doors soon and I’ve been looking for a good way to cut tenons. This is definitely getting built soon. Thanks for sharing. Glad you like the jig. From my own experience, this jig will handle door construction. Did all of our 6-panel interior doors in our home with it. That’s one of the projects that prompted the tall, wide fence. Fortunately, the hinge and lock styles get the mortises and you probably won’t run into a ceiling height issue. This jig will handle the rails and mullions just fine. I didn’t think to put it in the post, but when I cut the tenons I cut what I call exactly – plus. By that I mean that I try to make the perfect cut every time but I make sure that if I’m off a hair, I’m off a hair on the plus side. Strips of masking tape on the 10 X 10 side piece moves the board out to trim the tenon and end up with a perfect tenon cut. I do this on my first tenon on a piece of scrap. When it’s a perfect match to the mortise I just leave the tape in place and make my run – every tenon perfect. Good luck. Let me know how you come out. I just made it. One side anyway. I’ll add the long fence stop later. I’m making 5 panel doors for my house. I have 3 of 11 done so far. I was making the tenons by laying the rail flat on the table and running it over the dado blade several times. It’s tedious and ugly. This jig should cut the time in half and make a much cleaner cut. Thanks again. By the way thanks especially for the tip about the rip fence not being plumb. That never even occurred to me. Sure enough, the left side is plumb but the right side is off. Haha! That’s a great jig!! 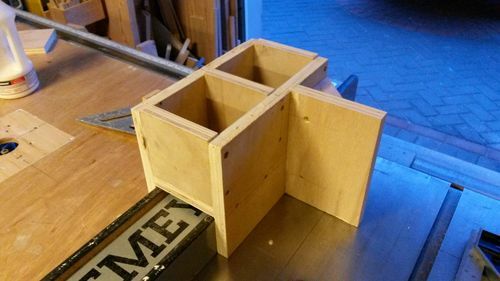 It should be perfect for making your doors. You used your own needs and imagination and made the jig you feel will be the best for you’re project. That’s the way to do it!! Let us know how it works out for you. I used it this weekend. It works very well. One work of caution. Sometimes I would end up with little shavings that did not get completely cut off. I was rushing and figured I would sand this stuff off afte I finished all the cutting. Well, when I turned the board around, these little shavings pushed the bottom of the board slightly out and I ended up with a couple of narrow tenons because of it. So sand off any swarf immediately after cutting before you flip the board. I thought in your PM that you were talking about a buildup of saw dust not cleaned off the table that pushed the boards out. Could you clarify what little shavings were left after cutting. I’m having trouble picturing it with a single blade unless the tenon shoulder is narrower than the blade. It’s probably just me but I don’t understand what shavings you mean. 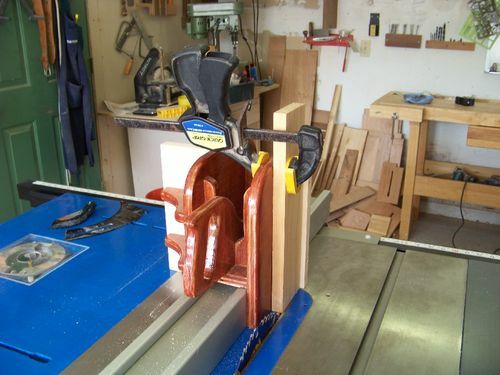 Were you using a dado set to cut the tenons and eliminate the waste cut off steps? This sounds like good info but I don’t understand. I received a PM from Brian (Doitforfun). He was using a stacked dado set to cut the tenons. Smart thinking because it eliminates the 4-sided trimming of waste with the miter gauge at the end. But the outside blade did leave a bit of fuzz at the edge of the tenon and, if it folded against the side of the wood, affected the spacing. Nice tips on using the dado set and what to watch for. Thanks Brian. He said he did 24 tenons in about 2-hours including set up. Pretty good production rate. Thanks Brian. Really good info.